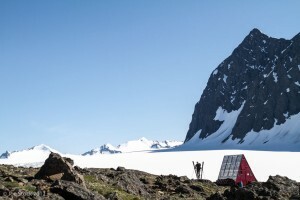 Dana Drummond at Pichler’s Perch cabin above the Eklutna Glacier, Western Chugach Mountains, Southcentral Alaska, Winter. MR.
On this Outdoor Explorer, we’re going to talk about how time spent outdoors can help us grow. Adrienne Lindholm has written a book about her path from mountain newbie trying to prove herself to becoming more interested in the journey. 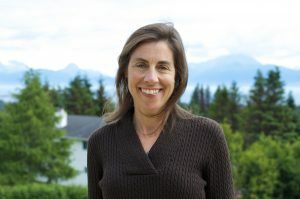 Carey Carpenter is campaigning for longer recess for Anchorage school children, and she’ll also talk about how outdoor adventures helped her cope with breast cancer. Lastly, we’ll hear a story about getting more minorities to be interested in going outside. Segment 1: “Book: It Happened Like This”. Adrienne Lindholm, author and avid outdoors-woman. Segment 2: “Increasing recess for kids & cancer support”. Carey Carpenter, Sand Lake Elementary mom. Segment 3: “Black folks in nature”. Todd Whitney from KALW – Crosscurrents. Here’s a link for listeners to sign-up for information on the recess/lunch issue.